The medium capacity BD70 is the ideal choice for plasterers, decorators and the finishing trade when drying out single rooms and extensions. Highly manoeuvrable for easy use, whilst still very durable for the construction industry. Suitable For Burst Pipes, Roof Leakage, Deflooding, Carpet Shampooing. Single Speed Fan. Continues Drainage Facility. 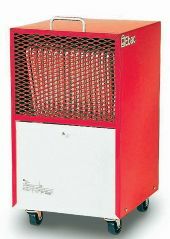 Hot Gas defrost For Low temperature Operation.